Dieter Zetsche is pictured at the presentation of the EQC on Tuesday in Sweden. 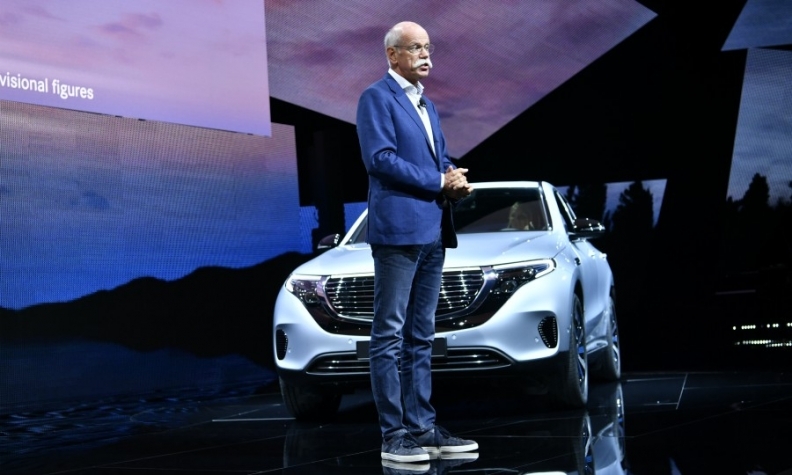 STOCKHOLM -- Daimler CEO Dieter Zetsche dialed back earlier forecasts for EV sales at the unveiling of the Mercedes-Benz EQC SUV, the first model from the automaker's new family of EQ-badged zero-emissions cars. Daimler, which is launching 10 full-electric Mercedes and Smart cars by 2022, initially forecast that sales of battery-powered models would account for up to 25 percent of its vehicle sales by 2025. Zetsche is now less optimistic. He said the ramp-up of EQC production would be slower than the rollout of internal combustion engine cars. Daimler's forecast for EV sales of 15 percent to 25 percent of its volume were originally "estimated very heavily from a top-down analysis," Zetsche said. "They are now being derived bottom-up from our plants, and at this point the view is certainly towards the lower end of this corridor," Zetsche told reporters here on the sidelines of the EQC presentation. "We are now just beginning (to enter the market), so we will definitely have harder evidence to better answer that question once we see just how customers in fact react to the vehicle," he said. Zetsche's caution comes amid Tesla's much publicized problems scaling up assembly of its Model 3 sedan, prompting questions about whether traditional automakers would also struggle with EV production issues. "The ramp-up curve will not be vertical, so volume will become relevant in the course of the year," Zetsche said. Daimler aims to guarantee the same level of quality for electric vehicles as it does for the combustion engine vehicles it has built for more than a century. "Our sales organization and dealers would have been happier with a much earlier and much steeper ramp-up of production, so this has it has nothing to do with demand," Zetsche said. "This is a new technology with new challenges, so we believe a flatter curve is more sensible." Zetsche also gave his strongest indication to date that, while electrified vehicles may dilute the brand’s profitability at first, it will not be a money-losing business. "That would be the case if the EQC generated negative contribution margins, then higher volumes would certainly hurt,” he explained, refuting speculation that an increase in production would result in a decrease in earnings on an absolute basis. “This vehicle will have a positive contribution margin from the first car on,” he said.